It takes us a while to find Wang Shu Shin. We go through the narrow alleys of Makum -a little town tucked deep inside upper Assam's picturesque tea country -in search of the man who, along with hundreds of others, was wronged and disowned by two warring nations. When we finally track him down in Tinsukia, seven kilometres away, he doesn't talk. Instead, he weeps. The 88-year-old Indian Chinese, now terminally ill, has seen a side of India that few want to talk about. Earlier this week, a book called Makam, written by award winning author Rita Choudhury, broke the silence. 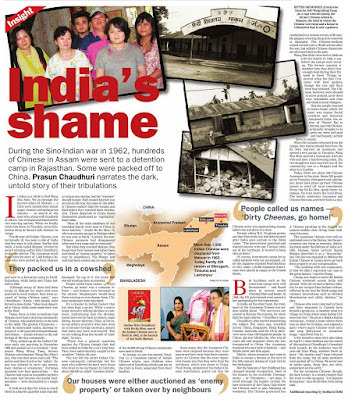 The Assamese novel deals with the story of 1,500 Indian Chinese who were picked up from Makum and sent to a detention camp in Deoli, Rajasthan, while India and China battled in 1962. "Although many of them had been iving in Makum for years and were married to local women, they were accused of being Chinese spies," says Choudhury. "About 1,000 people were forced to leave India." Most were deported to China, while some made their way to the West. Today, there is little to indicate that Makum once had a thriving community of Chinese, who settled down in the area in the 1830s. The ghostly Chinatown -with its desecrated tombs, skeletal remains of a 150-year-old club and dismantled homes -stands witness to the sufferings of the tiny community . "They picked up all the Indian Chinese early one morning in November 1962 and packed us in a cowshed," reminisces Wang Shing Tung, former Makum schoolmaster Wang Shu Shin's son, who was then seven years old. "The police said they'd jail us for `safety'. No one was allowed to carry any money, food, clothes or ornaments." 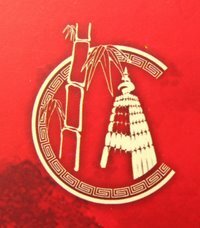 Fortunes amassed over four generations -the Chinese had come as tea garden workers but some had become successful businessmen -were decimated in a single day . It took seven days for them to reach Deoli in a heavily guarded train that didn't stop at any station, lest the "enemies" should escape. Half-cooked khichdi was served on the way , but some of the elderly Chinese couldn't take the trauma and died before they reached their destination. Those deported to China found themselves ghettoised as "capitalists" from India. "Most of the male members of our extended family were sent to China in three batches," recalls Ho Ko Men, 72, who ran a motor garage in Makum when he was sent to Deoli. "Luckily, the antiChinese paranoia had disappeared when our turn came and we returned." But when they reached Makum, they found that their houses had either been auctioned as "enemy property" or taken over by neighbours. The Wangs' saw mill had been sealed and its equipment damaged. On top of it, the locals had started treating them as enemies. People called them names -`Dirty Cheenas, go home' was a common refrain -and women were harassed on the streets. Shopkeepers would keep them waiting or overcharge them. Chinese businesses were boycotted. It's a chapter in Indian history that has been kept a secret. While a senior home ministry official declines to comment, maintaining that the developments were too far back in history , Jagat Mehta, former director, China, at the external affairs ministry who later went on to become foreign secretary, admits that India may have overreacted. "But we are talking from the benefit of hindsight," he says. "There was a general suspicion against the Chinese though they had been settled in India for a very long time. They were unfortunately caught in the crossfire," Mehta, 88, says. The war left the entire Indian Chinese community vulnerable, but the ones who suffered the most were those who lived in the northeast. In Calcutta, about 500-600 so-called "stateless aliens" of the 50,000-strong Chinese community were sent to Deoli. In Assam, no one was spared. KwaiYun Li, a Canadian author of Indian Chinese origin, says children were taken out of boarding schools and put on the train to Deoli, separated from their families. Some argue that the Assamese Chinese were targeted because they were poorer and less vocal than their counterparts in Calcutta. But the more important reason was that they were from the northeast, which was closer to China. Paul Chung, president of the Indian Chinese Association, points out that the Chinese army was approaching Assam before the war drew to a close. Former editor B.G. Verghese points out that Sino-India ties had deteriorated after India gave asylum to the Dalai Lama. "The government panicked and wanted anyone with any Chinese links out of the northeast. It wanted to keep tabs on them." Of course, internment camps for so called enemies were not uncommon. After the Japanese attacked Pearl Harbour in 1941, some 1,10,000 Japanese Americans were placed in camps in the United States. But incidents such as the American camps were well documented -and found place in several award winning films and books. In 1988, the US government even passed a law apologising for the internment. In India, on the other hand, the treatment of the Assamese Chinese was seldom talked about. "The survivors are scared to discuss the trauma, let alone fight for legal redress," Choudhury says. Choudhury, who started researching the subject five years ago, travelled across China, Singapore, Hong Kong, Canada, Australia and the US to interview more than 100 displaced people. In China, she met Mailin Ho, who was 20 years old and pregnant when she was transported to China. Her Assamese husband was sent back to Makum -and Mailin never met him again. Mailin, whose ancestors had come to India to escape a famine at the turn of the 19th century , dreams of a last visit to her birthplace. But the Makum of her childhood has changed beyond recognition. Most of the houses in the erstwhile Cheenapatutty -or Chinatown -are gone. A stroll through the hamlet reveals the bare structure of the China Club where the Chinese used to play Mahjong on weekends. The Chinese graveyard lies vandalised in a remote corner, with marble plaques covering the graves removed or damaged. The Chinese-medium school turned into a Hindi school after the war, but telltale Chinese characters are still inscribed on the gate. Wang Shu Shin returned to Makum with his family in 1966, a year before the camps were wound up. The former inmates remember how they didn't have enough food during their first week in Deoli. Things improved when the Red Cross came with food packets, though the rice and flour were bug infested. The Chinese, however, were allowed to move around, grow their own vegetables and even sell them to local villagers. But the people yearned to return home, which, for most, was Assam. Social scientist and historian Amalendu Guha, the author of Planter Raj to Swaraj, says the Chinese, originally brought in to grow tea, were well paid and had happily settled down in Assam. When the inmates returned from the camps, they had to rebuild their lives. Ho Ko Men married an Assamese and opened a new garage in Tinsukia. Wang hu Shin started a restaurant with his wife and later a hairdressing salon. His two daughters have married out of the community, one to a Bengali and the ther to a Gurkha. Today, there are about 500 Chinese assamese in the state. Some 250 people are in Tinsukia, Dibrugarh and Lakhimur. 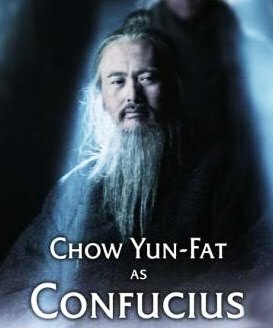 Some have given up their Chinese names to ward off local resentment. Many, like Ho Ko Men, speak fluent Asamese. Ho even wears the local dress. The family celebrates Assamese and chinese festivals, and their food is a mix. A Chinese painting in the typical Assamese middle class living room indicates his roots. The Assamese Chinese were well assimilated even in the Sixties, but the government saw them as enemies, detaining them under the Defence of India Act, 1962. Human rights activist Sujato Bhadra describes it as a "draconian" law. The law was repealed in 1968 but the Indian Chinese in Assam never got back their property or any compensation. "The problem with our community is that we didn't represent our case to the government," regrets Chung. 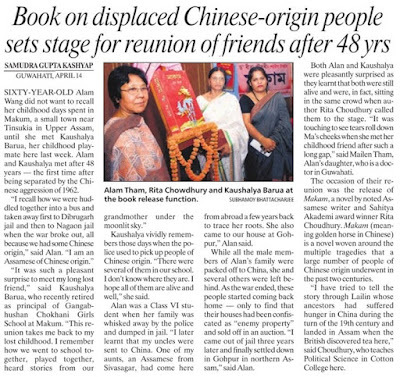 Chung now hopes to unite the Indian Chinese scattered across India and abroad. "After all we have a distinct identity in our unique Sino-Indian culture, reflected in our love for Hindi songs and culinary innovations such as chicken Manchurian and chilly chicken," he says. Chinese who were interned in Deoli and later migrated to Canada have formed a group too. A member went to a village in China where some Indian Chinese now live. "He ate at a Hakka-Indian restaurant, visited a home where there was an altar for Krishna, and enjoyed a party where many Chinese wore saris and sang Bollywood or Assamese songs," says Kwai-Yun Li. A few tentative steps were also taken on April 11 when Makum was the centre of discussion at Choudhury's Guwahati book launch. In the audience was 66year-old Alan Wang, another Deoli inmate. "My mother and I were released from the camp, but all male members were packed off to China. We never met or spoke again. Hope they are alive, somewhere on the earth." For the Assamese Chinese, though, the dark history is a closed chapter that few want to rake up again. "Let bygones be bygones," says Ho Ko Men with a deep sigh. Maybe the GREATEST post that I read all week?! i read this article i thought i could also make comment due to this brilliant article. undertaking that I am just now operating on, and I have been on the look out for such info. Howdy! This post couldn't be written any better! Looking at this article reminds me of my previous roommate! He always kept talking about this. I most certainly will send this post to him. Pretty sure he will have a good read. Many thanks for sharing! What's up to all, for the reason that I am truly eager of reading this weblog's post to be updated regularly. of my blog visitors have complained about my site not working correctly in Explorer but looks great in Chrome. you have here on this post. I am returning to your web site for more soon. I do consider all the ideas you've introduced in your post. They are very convincing and will certainly work. Nonetheless, the posts are very quick for newbies. May you please prolong them a little from subsequent time? Thanks for the post. I do not know if it's just me or if everybody else experiencing problems with your website. It appears like some of the written text within your posts are running off the screen. Can somebody else please provide feedback and let me know if this is happening to them too? This might be a issue with my browser because I've had this happen previously. I'm now not certain the place you are getting your info, however great topic. I must spend a while learning more or understanding more. Thanks for fantastic information I used to be searching for this information for my mission. Yes! Finally something about work from home business opportunities. list of all of all your shared pages like your linkedin profile, Facebook page or twitter feed? few questions for you if it's okay. Could it be simply me or does it appear like a few of these remarks appear as if they are coming from brain dead people? :-P And, if you are posting at additional online sites, I would like to keep up with everything fresh you have to post. Would you post a list of all of all your social pages like your twitter feed, Facebook page or linkedin profile? What's up, after reading this awesome post i am too glad to share my know-how here with friends. Nice answer back in return of this difficulty with real arguments and describing everything concerning that. I'll bookmark your blog and check once more right here regularly. I am fairly sure I will be told many new stuff proper right here! Best of luck for the next! however I find this matter to be really one thing which I believe I might never understand. I usually do not drop a bunch of responses, but I browsed some responses here "FILM FESTIVAL". Is it just me or do some of the comments come across as if they are left by brain dead people? I don't even know the way I ended up here, however I thought this post was good. I don't recognize who you are but definitely you're going to a famous blogger should you are not already. Cheers! used to be great. I don't know who you are however definitely you're going to a well-known blogger if you are not already. I'd really like to be a part of online community where I can get responses from other experienced people that share the same interest. If you have any recommendations, please let me know. Thank you! wonderful publish, very informative. I'm wondering why the other specialists of this sector don't understand this. What's up, after reading this awesome article i am too happy to share my familiarity here with friends. new reader. What could you recommend about your submit that you made some days ago? Hello there! This post couldn't be written any better! Reading through this post reminds me of my previous room mate! He always kept chatting about this. I will forward this write-up to him. Pretty sure he will have a good read. Thanks for sharing!